Who needs European royal newlyweds when you've got this adorable pair from Bhutan? Last month the 31-year-old King of Bhutan, Jigme Khesar Namgyel Wangchuck, married Jetsun Pema, a 21-year-old commoner with an airline pilot dad and plenty of fashion cred that caught our attention. Since the October royal wedding, the pair have made plenty of appearances clad in all sorts of colorful looks. 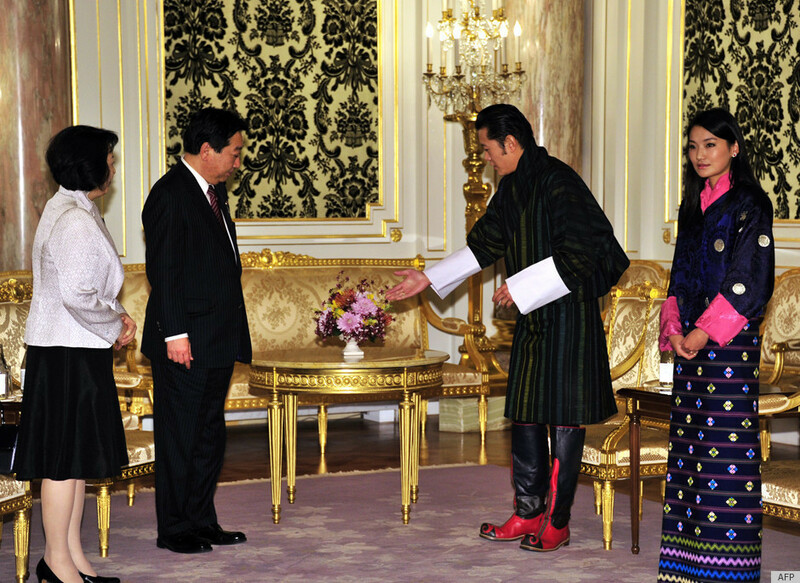 According to Business Bhutan, the newly-crowned Pema must dress in colors that reflect her kham (birth element), in accordance with Tibetan astrology. We're not sure what Pema's kham is, but today she stepped out in lovely navy and pink robes with flower embroidery, leaving her glossy hair loose. But truthfully our eyes quickly shifted over to her husband, who usually goes subtle in dark-colored garb. Today, however, the King of Bhutan got creative with what we can only describe as cowboy boots (although we're sure they're called something else in Bhutan). The royal showed off his red and black kicks to the Japanese prime minister, Yoshihiko Noda, and his wife, Hitomi. The king and queen of Bhutan are currently being hosted in Japan as state guests... and resident fashion plates. Check out Jigme Khesar's fancy footwear and his bride's lovely, tamer ensemble in the slideshow below!